As it turns out, the line between looking like a genius and feeling like an idiot is a pretty thin one. For me, the tipping point came at around 11:45am on Thursday. I’d just made it into the Rod Laver Arena, having spent the past hour legging it back to my hotel where I’d stupidly left my laptop, and this was the moment Viktoria Kuzmova, who I’d (ridiculously) picked to reach the quarter-finals, had numerous break points against Elina Svitolina at 4-4 in the first set. She didn’t convert any of them and, as is so often the case, ended up dropping her own serve in the very next game. Things unravelled pretty quickly from there as Svitolina closed out a 6-4, 6-1 victory with an ace. How gutting, and how different it might have been if she’d taken one of those break points. And so begins the inquest. Why did Kuzmova put up less of a challenge in the second set? How well did Svitolina play? And, of course, what on earth was I thinking?! To be honest, I think I explained my thought process in a previous blog. At no stage this week did Kuzmova come close to validating my pick, but an opening set full of promise at least got me tingling with excitement a little. A bad serving day contributed considerably to Kuzmova’s downfall. Her 14 aces in the first round had taken her to the top of the 2019 WTA ace leaderboard with 70. Today, however, she served just one ace against five double faults. Facing an opponent of Svitolina’s quality, while suffering a let-down with her biggest weapon, well that was never going to get the job done. Nevertheless, this was a week of progress: she reached the second round here for the first time, she played on Rod Laver Arena for the first time, and she got mentioned on The Tennis Podcast for the first time. Kuzmova will remain on my radar in the future. As David put it: “she can play”. To add to what I wrote about her career highlights in Tuesday’s blog, I noticed that she beat both Aliaksandra Sasnovich and Aryna Sabalenka in Fed Cup last year. The idea that she would reach the quarter-finals this week was certainly far-fetched, but her breakthrough moment could be around the corner. As a side note, I heartily recommend having your own Kuzmova. Pick a player you’re less familiar with, find out about them, watch their matches, invest your time, feel the highs and lows. It’s a lot of fun, and you never know where the road will take you. I wasn’t sure how I felt about these final set tiebreaks to ten, but seeing Nishikori and Karlovic play a blinder has turned me into a believer. 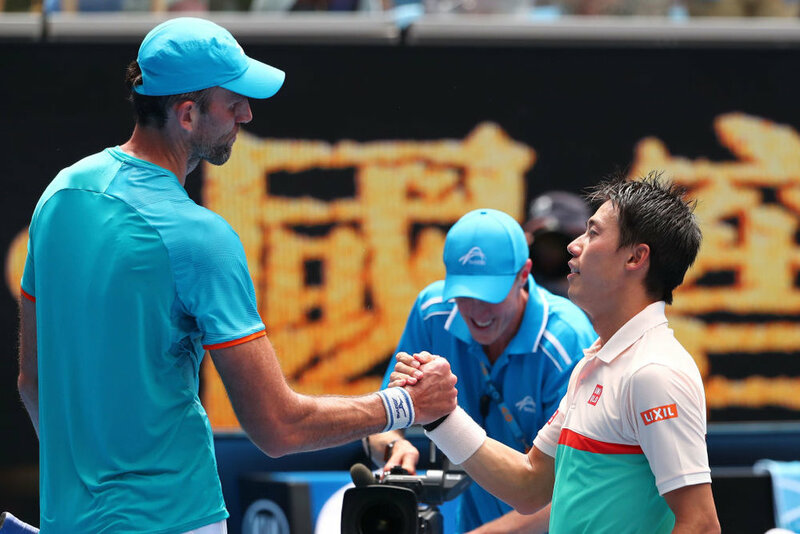 It provided a real climax, felt more special than a regular tiebreak, and was endlessly more enthralling than a laborious crawl to the finish line, which can happen with big servers like Karlovic. Speaking of Karlovic, he turns 40 next month, but if he can continue to serve like he is at the moment, he may never need to retire. As Nishikori put it, the 59 aces he hit today is almost as many as some players hit in a year. Jack Sock continues to stake his claim as the best doubles player in the world. Playing with No.89 Jackson Withrow, they took out veterans and No.2 seeds Juan Sebastian Cabal and Robert Farah. Not only does Sock have the rare ability to take complete ownership of a doubles court, he can also lift his partner. I was reading before coming to Melbourne about the city’s changeable weather. A 1992 single by Crowded House is apparently inspired by a cliché referring to it: Four Seasons In One Day. I don’t think we quite had that today, but there was an overcast period, a sunny spell, and our first rain delay. Fortunately, with three roofs at Melbourne Park, play wasn’t halted for too long (we’ll have to wait for Roland Garros for that torture). But the stoppage, combined with lengthy matches, meant that the night session was delayed by over 90 minutes. This created an incredible buzz around the grounds in the evening. There were so many people packed in, and such a fun vibe, with many choosing to watch Alex Bolt’s comeback victory over Gilles Simon on the big screens. The atmosphere put me in behind of a moment at last summer’s Wimbledon; in the minutes following the conclusion of that Kevin Anderson vs. John Isner match. There was this energy in the air that comes with sport at night. People weren’t quite sure what was going to happen with the Nadal vs Djokovic match to come, and this unknown created an excitement. Of course night sessions aren’t unusual at the Australian Open, but they still feel special, particularly so at the crossover between day and night. There was delirium in the media centre radio room this evening as Anglo-French relations were put to the test. The French journalists were desperately urging Jeremy Chardy on against Alexander Zverev, while the British were hoping Zverev would get the job done as quickly as possible – Konta was on next and the clock was ticking towards midnight at a rate of knots. The French got their way – Chardy mounted a comeback, although not a victorious one – and the Brits began their commentary in the early hours. A word on Joao Sousa. That guy has been dealt some pretty rough Grand Slam draws in the past: 33% of his losses 24 Grand Slam losses have come against Andy Murray and Novak Djokovic. But with neither of them in sight, he’s made it through to round three after two five-set battles (against Pella and Kohlschreiber) on the outside courts, emptying his tank as always. It took Sousa 23 attempts to reach a Grand Slam last 16 for the first time, before he finally did it at last year’s US Open. He’ll have the chance to get there again on Saturday when he faces Kei Nishikori, himself a five-set specialist this tournament. John Millman played with the Dunlop balls in Sydney: “(It was) really tough to generate (pace) with the cold out there, the balls are pretty dead. The balls are really s**t when it gets like that. Roger Federer gave a considered response: “Well, they definitely play a touch different to the ones we've had the last couple years. At night the spin is not taking off tremendously. It is true, you can't out-spin a guy here. I think that's clear. Maria Sakkari and Stefanos Tsitsipas have both been scheduled for 11am on Friday. If that wasn’t bad enough for the Greek fans, who will have to split their support, they’re both scheduled on courts without seating for grounds pass holders (Rod Laver Arena & Margaret Court Arena). This is understandable – their respective matches against Ash Barty and Nikoloz Basilashvili are among the best of the day – but it’s also a great shame, because the vocal support from Greek fans, which has added so much to the first few days, will likely be considerably diminished. Caroline Wozniacki and Maria Sharapova meet for the 11th time in one of the main matches on Friday. They have not played each other since Madrid 2015. Of great interest to us here, however, is the words they’ve exchanged since then. At the 2017 US Open, playing her first Grand Slam since returning from her drugs ban, Sharapova was given headline billing on Arthur Ashe Stadium for her first two matches. Wozniacki, meanwhile, ranked No.5 at the time, was shunted to court 5 for her match against Ekaterina Makarova. After losing, Wozniacki had some thoughts: “Putting out a schedule where the No. 5 is playing on Court 5, fifth match on after 11pm, I think that’s unacceptable. And when you look on Centre Court – I understand completely the business side of things – but someone who comes back from a drugs sentence, performance-enhancing drugs, and all of a sudden gets to play every single match on Centre Court, I think that’s a questionable thing to do.” Let’s hope they bring that tension onto court.